Special Offer: When you buy one or more tins, you'll get a roll of long-life masking tape worth £4.99 FREE! It is best known to create less ‘build-up’ than many traditional antifoulings - a revelation to some given the value of this product. It is best suited to GRP, Wood, Steel and Ferro-Cement as well as use on drying moorings. It is not suitable for aluminium or galvanised surfaces. Substrates GRP, wood, steel, and ferro-cement. Not suitable for aluminium or galvanised surfaces. Max. time before launch 2-3 months dependent on ambient temperature. * The coverage has been calculated for the stated volume solids and dry film thickness. A practical spreading rate will depend on the actual dry film thickness, the nature of the substrate, and the relevant consumption factor. The physical constants are subject to normal manufacturing tolerances. This item is classed as a HAZARDOUS PRODUCT and has delivery/courier restrictions. Unfortunately, delivey cannot be made to addresses outside the UK and cannot be made to those with the following GB postcode prefixes: BT1-BT99, GY, IM, JE, KA27, PA41-PA78, PO30-PO41, TR21, TR25. Customers from Barra (HS9) wishing to purchase this product should contact us first for a quote on delivery. Hauled the boat out on 26/10/2013 after seven months on a swing mooring and was very impressed with the results of this antifouling - just a thin layer of slime, otherwise clean as a whistle. A quick blast with the jet hose and she ready for winter storage. I shall be using this again. 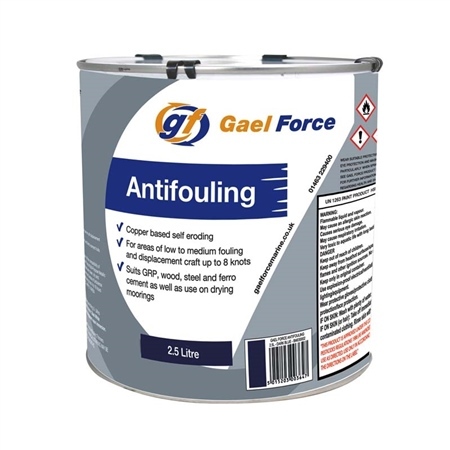 I've been using the antifouling for the past 5 years and have found the product to be very good. I paint the hull every year and it only requires light scrubbing after a year in the water. As usual, prompt service and first class product! A good quality, reasonably priced anti-foul. Quite happy with this. Delivery was also very quick.